Any golfers out there? 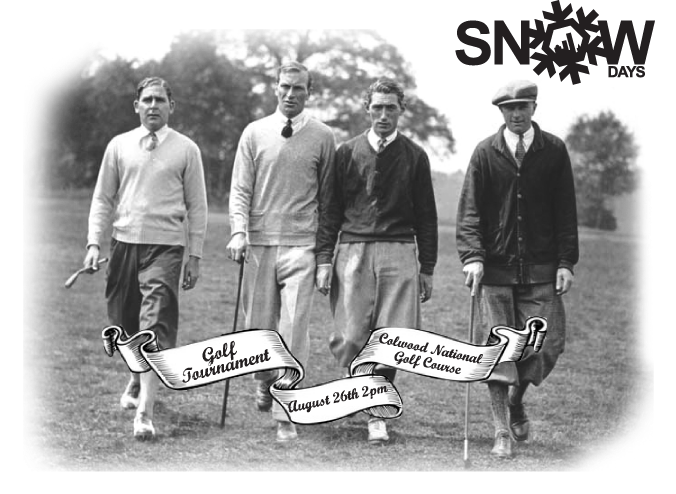 Snowdays needs YOU to compete for wonderful prizes at the Inaugural Golf Days Tournament. The tournament is Friday, August 26th at Colwood National Golf Course in Portland. 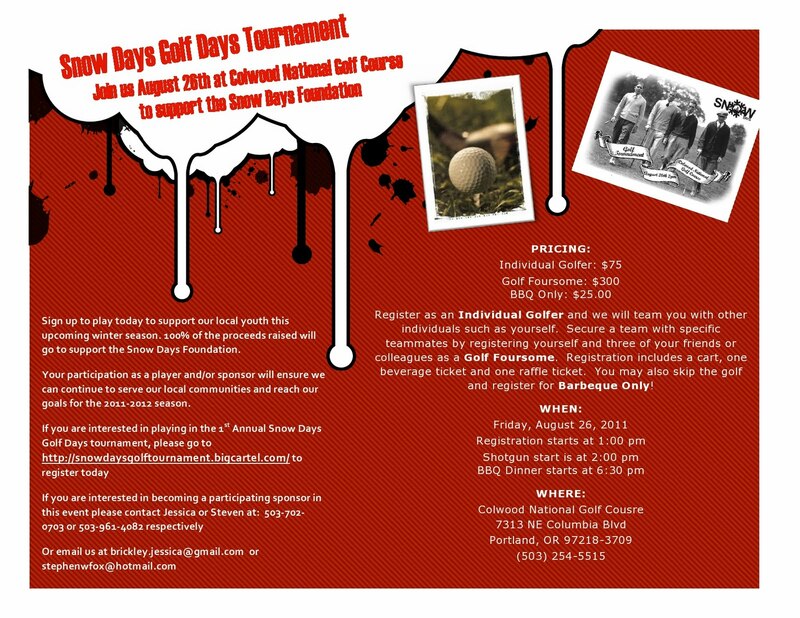 Registration is at 1:00, shotgun start at 2:00. Some of the prizes available are Timberline lift tickets, a $100 Jimmy Mak's gift certificate, a Nike golf bag and shoe carrier, eight (yes, 8, Bob) rounds of golf at Colwood, Portland Timbers tickets, gift packages from RVCA, Bonfire and Skullcandy and a 3-burner gas grill. Entry is a $75 charity write-off per golfer and covers your cart, your first drink ticket (more available thanks to Heineken), a raffle ticket and a bag of goodies from our sponsors. If you have three friends, sign up together to guarantee your foursome. Mulligan tickets will be for sale and we have some other surprises for you from our hole sponsors. 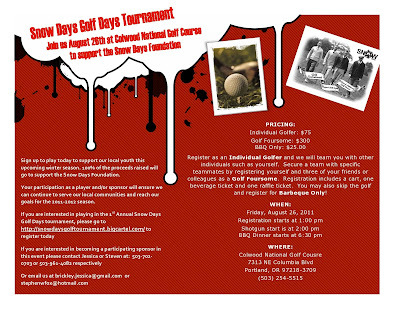 Don't golf but still want to give something back to the local snowboarding community? Show up at 6:30 with $25 for the kids and we'll treat you to a BBQ dinner. That way you can skip all the walking and still have a chance to buy raffle tickets and bid on our silent auctions. Don't wait! Registration closes August 19. Click the thumbnail below for all the details and go to our purpose-built payment page to register. Yes, all the proceeds go to charity. FORE!